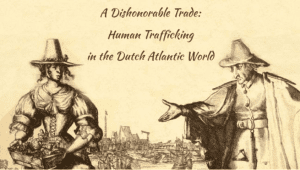 The Schenectady County Historical Society has announced “A Dishonorable Trade: Human Trafficking in the Dutch Atlantic World,” a traveling exhibition opening to the public on Saturday, January 26 at 2 pm at the Mabee Farm Historic Site. The enslaved people of New York are in a sense a lost people. Without documents or material culture to tell their story, they have all but vanished from history. The Dishonorable Trade project aims to bring the often forgotten legacy of slavery out of the shadows, and to shed light on the lives and stories of enslaved people. The exhibition was originally developed for the Crailo Historic Site in Rensselaer. Crailo staff worked with Yale History professors, the Gilder Lehrman Center, the American History Workshop, the Smithsonian Museum of African American History and Culture, and experts in the interpretation of the history of slavery and civil rights to produce the exhibition. Additionally, artists and educators offered creative ways to interpret the history of enslaved people, whose own words and objects are missing from the historical record. The exhibition will be on display at the Mabee Farm Historic Site throughout 2019. An Overview of the Slave Trade presented by the Underground Railroad History Project, set for Saturday, Jan 26 at 2 pm at Mabee Farm. Mary Liz and Paul Stewart of the URHP will be at the exhibition opening reception of A Dishonorable Trade to provide an overview of the slave trade, and to discuss slavery research resources. Followed by a 30 minute Q&A. Refreshments served. Free for members, $5 for general public. Slavery in the Capital Region: A Conversation on African American History with Dr. Oscar Williams, set for Saturday, Feb 23 at 2 pm at Mabee Farm. Dr. Oscar Williams, Chair of UAlbany’s Africana Studies department, is an expert in African American history. Williams will hsot a conversation on the history of slavery in the region. Free for members, $5 for general public. Slavery and Dutch-Palatine Farmers w/ Travis Bowman, set for Saturday, March 23 at 2 pm at Mabee Farm. Travis Bowman, Senior Curator of the New York State Bureau of Historic Sites will discuss the surprisingly large role that slavery played in colonial and revolutionary era New York. Mr. Bowman will examine how slavery evolved in New York under the Dutch, British, and American systems of government, and how the institution was utilized at a local and personal level among immigrants and their descendants in the Hudson and Mohawk Valleys. Free for members, $5 for general public. The exhibition is part of the Dishonorable Trade exhibition and lecture series, presented in partnership with the New York State Office of Parks, Recreation & Historic Preservation and the Underground Railroad History Project of the Capital Region.